Our old fashioned sweet potato pie will take you back to grandma’s kitchen with just one bite! This sweet potato pie recipe is a classic that the whole family will enjoy. Whether you are entertaining guests or just in the mood for a week-night treat, this recipe does not disappoint. Easy to make and even easier to enjoy. Serve this old fashioned sweet potato pie with a scoop of your favorite vanilla ice cream, a dollop of fresh whipped cream, or simply by itself. And most importantly, don’t forget to share amongst loved ones! Preheat oven to 425º F. Line a 9-inch pie plate with 1 layer of pastry; set aside. Combine 1 cup of water and the salt in a large saucepan. Add sweet potatoes; cover and bring to a boil over high heat. Reduce heat and simmer until sweet potatoes are just barely tender when pierced, about 5 minutes. Drain slices, rinse with cold water until cool to touch. Drain slices well; transfer them to a large mixing bowl. To sweet potatoes, add sugars, lemon juice, flour and pumpkin pie spice. Toss gently with a spatula until slices are evenly coated. 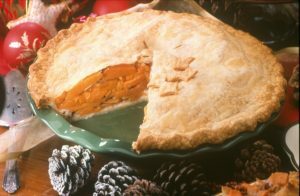 Spoon sweet potatoes into pastry-lined pie plate; dot top of potatoes with butter. Place top pastry over filling and crimp top and bottom pastries together to make decorative edge. Cut 3 to 4 slits in the top to allow steam to escape. Bake in oven until crust is browned and sweet potatoes are tender when pierced, about 50 minutes. Cool pie on wire rack at least 1 hour. Serve warm or cool. If edges of crust start to brown too quickly, drape lightly with strips of foil.